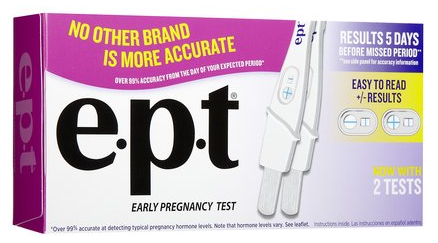 I remember being a teenager and buying a home pregnancy test for a friend with a scare, too embarrassed (and afraid of being recognized by someone) to buy it herself. I’m not sure why I wasn’t equally afraid – we lived in the same town; I either had less innate shame, or the easy courage that comes of having nothing to hide. In any case, her dread was contagious and we both ended up, anxious and sick with tension, waiting at her house (because no one else was at home) for those magic lines to appear: one line: not pregnant, good. Two lines: pregnant, and VERY bad. Those few minutes seem to drag on for eternity. One line … one line …. still only one line. Only one line! We were both relieved. Fast forward 10 years, now wanting and trying to get pregnant, and it stuns me to think that the test most of us would have loaded with that same teenage anxiety and fear, now represents an entirely different set of emotions, most ironically, the same amount of hope for the precisely different outcome! When my friends try to get pregnant, many of them begin taking pregnancy test after pregnancy test and layering huge amounts of tension and worry into the process. We’re talking twice a day. We’re talking every post-coffee pee break. We’re talking all the time. They want to see ‘positive’ so much. My friends aren’t crazy, of course. In certain circumstances, especially with certain tests (and if they would only wait a few days after each test), that line might show up. 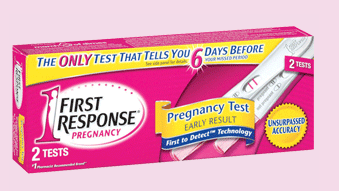 So that leads us all to the questions: which home pregnancy test is the best? Which test shows that you are pregnant the earliest? Happily, a group of scientists wanted to answer this same question*. They compared the most popular over the counter tests: ClearBlue, EPT (Error Proof Test) , and First Response. I’ll skip the scientific part of testing and methods, and get to the good stuff: women who were trying to get pregnant (and ended up pregnant at the time their urine was tested) had their urine tested on the first day of their missed menstrual cycle, and then again 3 days later (so they were 4 days “late”). The study figured out when the women should have their next menses by averaging their last 5 menstrual cycles. The winner for earliest detection was First Response, hands down…or seat down. RESULTS: The study would say, on the day of your missed menses, you can get 51% or 67% accuracy from the digital and manual tests, respectively. Accuracy increases daily after that, but the only time it gets to 100% accuracy is 5 days after your missed period (the day of your missed menses is Day 1). Obviously use the manual test. RESULTS: Accuracy is 68% for the digital version, and 53% for the manual test, on the day of your expected period. 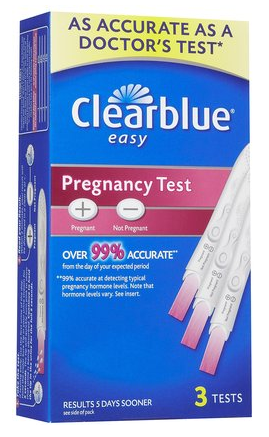 Similar to ClearBlue in that the 99% or better claim is only true 5 days after missed menses. Their digital version tested better. RESULTS: Accuracy was 96% for women on the day of the missed period. It was 99-100% accurate on Day 3 of the missed menstrual cycle. Of all 3 brands, it was the only one that showed a positive 6 days before the missed menses … but only in 25% of time. Overall, the rates of the other tests on day of missed menses were equal to this brand’s rate 3 days before your missed period. Manual and digital tests were basically the same. When you think you miss your period, wait a few more days, then take a home pregnancy test. It increases the accuracy to wait. All tests studied were 100% accurate 5 days after the expected first day of the period. If you can’t wait that long, use First Response for a more accurate test. By old I mean I just made it up. Feel free to spread the wisdom! * Here’s the study I used for this information … if you’re interested in that sort of thing.